Right after the S8’s unboxing, the Korean major Samsung is now rolling out the official Android 7.0 Nougat update to its S-line Tab- The Galaxy Tab S2. The Tab S2 is a premium tablet from Samsung that was released in Q3 of 2105 with two different variants, namely- 8.0 LTE and 9.7 WiFi. Meanwhile, the firmware update is being pushed only for the regions of Italy and Germany. So we predict a broader rollout soon for the other regions like Russia, Egypt, France, UK, Spain etc. The update comes as an OTA(Over-The-Air) as well as a full Odin flashable stock firmware. Download the update package from below. Upgrading the firmware will take the SM-T715 variant to its PDA T715XXU2CQCL and CSC T715OXA2CQCL respectively. Similarly, the SM-T810 variant will be updated to the PDA T810XXU2DQCL and CSC T810DBT2DQCL in particular. In a nutshell, the update not only brings Nougat but also brings the latest April 1, 2017, security patch level from the AOSP. Updating the firmware will give you bonus features like- the Game Launcher, improved performance, a newer user interface, multi-window etc. The full changelog is given below. You may also like to see how to convert Samsung phone to Galaxy S8. The OTA file weighs around 954.93MB, whereas the full firmware file weighs 1.50GB. You will only receive the OTA if your device is on the latest Stock Marshmallow firmware. If you haven’t received it yet, you can download the OTA files from the links given below. How to update Galaxy Tab S2 to stock official Android 7.0 Nougat firmware? 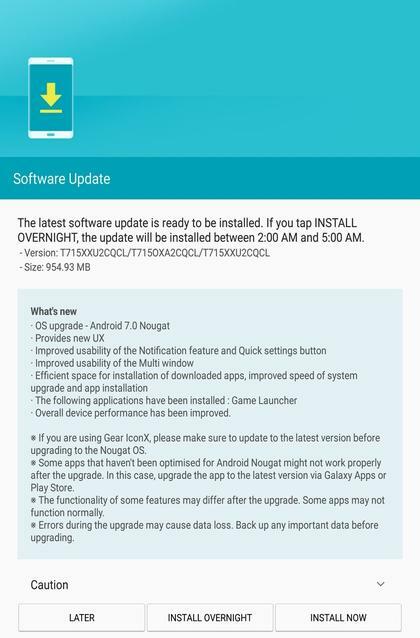 As of now, the Nougat update comes only to Tab S2 SM-T715 in Italy and Galaxy Tab S2 WiFi SM-T810 in Germany. 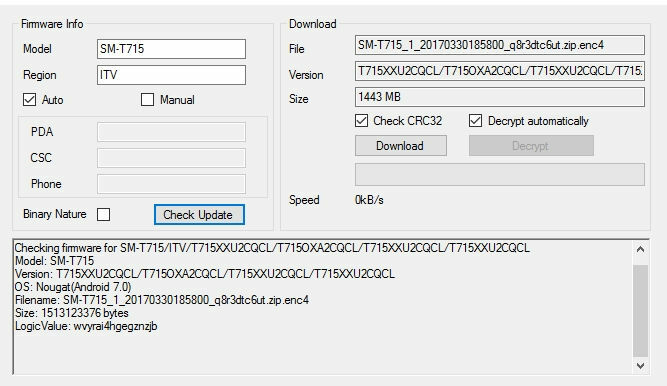 Download the full stock firmware file from above via free high-speed SamFirm and head over to our previous tutorial on how to install. If you face any issues downloading or installing the same, reach out to us via the comments section below. Thanks for alerting me to this. I have a SM-T815, which the GSM variant of the Tab S2. Is there an update available for this version do you know?